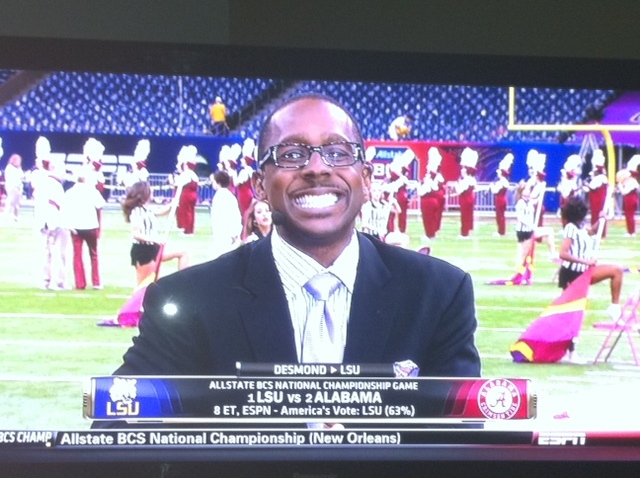 Its been a fantastic season here at Cole’s Gameday Blog. The boys down in the lab have been working overtime running the numbers and the results are in. 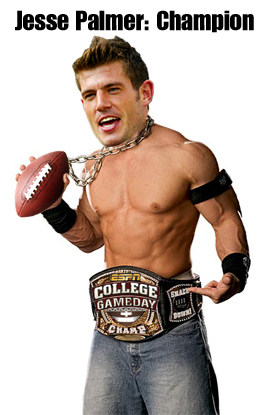 Your 2011-2012 Gameday blog champion is Jesse Palmer coming in at 83.7% correct picks on the year with a record of 36-7. Congratulations to Jesse Palmer. Below is one shot from the photo-shoot where we awarded him his College Gameday championship belt. In addition, we would like to hand out a few post-season awards to noteworthy members of the college football community. The Dirk Nowitzki of Defensive Ends: Bjorn Werner. Brent Musberger labeled Werner this in Week 3. I’m still not sure what it means, but he sure as hell deserves this award. Coach Who Didn’t Give a Crap the Most: Dabo Swinney. He said it regarding Auburn’s pace of play, but pretty much the whole season he didn’t give a crap, and led Clemson to its best year in decades. Best Name of the Year: Munchie Legeaux, Quarterback from Cincinatti. Self explanatory. Most Italian Name in College Football: Tino Sunseri, Quarterback from Pitt. Following in his father’s footsteps (Sal Sunseri). Best Andre 3000 Look-alike: Robert Griffin III. This only came into play near the very end of the year, but some of us at Cole’s Gameday Blog have been saying it from the beginning. The Joe Avezzano Award (coordinator who gets 300% more TV time than his head coach): Phil Bennett. Brother of our highschool’s football coach, Jim Bennett, Phil could be seen roughly 20 feet out in front of Art Briles on the field any time there was a cut to the sideline during a Baylor game. Typically he was wearing a bright yellow shirt, while his coach stood in the background unassumingly. Worst football year for a state: Florida. Lol. Thanks for tuning in. We’ll be updating the site occasionally during the offseason, but starting next fall we will be back in full swing. Alright ladies and gents, with all precincts reporting and all picks tallied, the results are in. It is official. 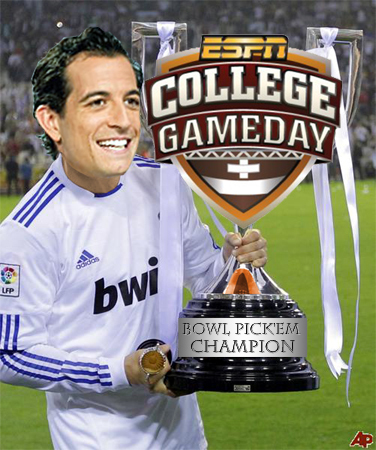 Your 2011-12 Bowl Pick’em champion is one Tony Reali of Around the Horn fame. His 25-10 record was the tops of anyone who picked more than two games. Congratulations to Tony Reali for all of his hard work. I know that hair doesn’t grease itself up every day. The final results are listed below. For championship contention I require our experts to more than just a few games, so coming up behind Tony Reali is Bill Plaschke, with Robert Smith taking the bronze medal. Todd McShay was last year’s winner going 20-11, so this is a much stronger year with several experts, including my girlfriend, putting up 20+ correct picks. And of course, we have to shame some of this year’s losers. Tim Cowlishaw brought up the rear this year, and Mike Greenberg is our only other expert who did the full bowl pick’em slate to have a losing record. 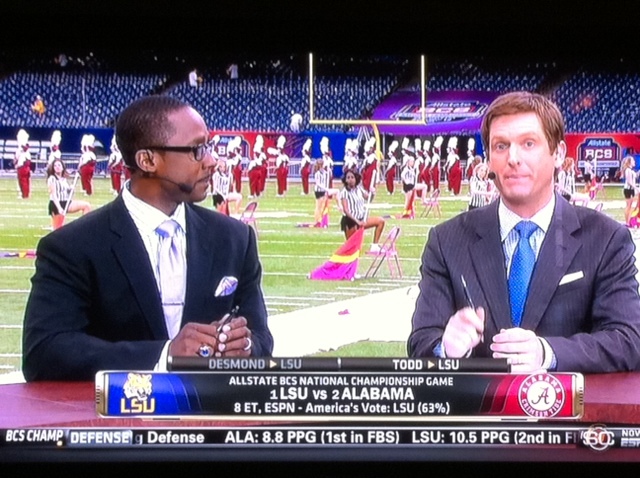 Also of note, the entire Gameday crew posted losing records (oops). I’ll be updating pages over the next few days if you need to see everyone’s full results. I’ll also be back to post my post-season awards once they are completed. P.S. Yours truly went 23-12 on picks. Just incase you were wondering. Ladies and gents, the day has finally come. THE GAME OF THE CENTURY…. AGAIN! Tonight, we will see perhaps one of the greatest teams we’ve seen in college football history in LSU, who is undefeated, won the toughest conference in the nation, and has the most impressive resume of anyone in the country after beating 8 ranked opponents this season. We will also see Alabama, the team that proves that every week is not a playoff in the BCS, that only played 4 ranked opponents, that didn’t win this game the first time at home, the team that didn’t play in their conference championship (much less win it), and the greatest defense of all time that gave up 21 to FCS Georgia Southern. In honor of this occasion, I am posting our BCS Championship rundown with everyone’s championship picks that I have so far, and more as they roll in tonight so stay tuned. 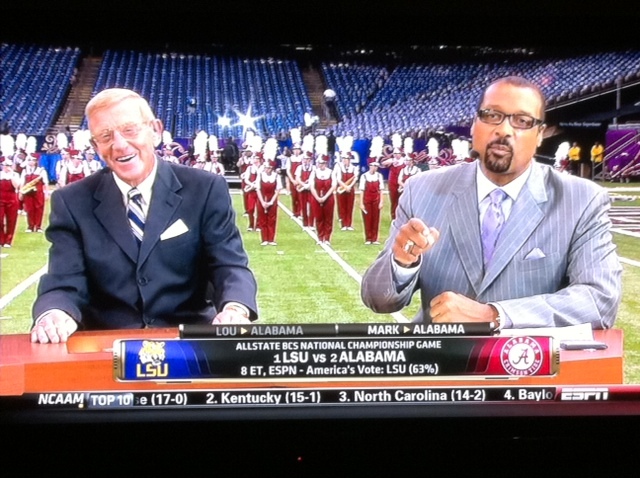 Currently we’re at 23 to 11 in favor of LSU from our panel of experts. 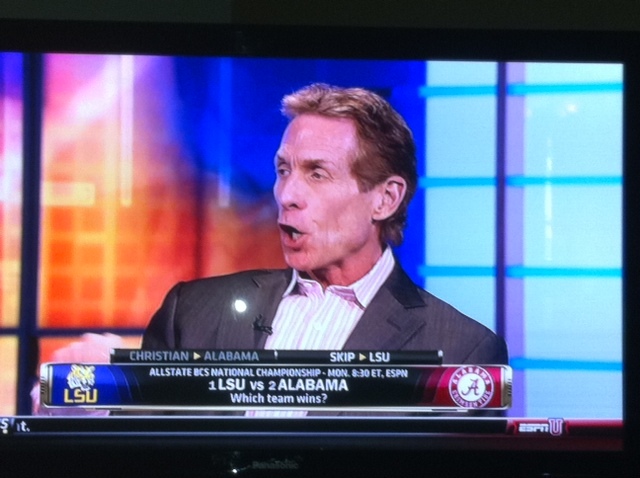 Skip Bayless: "LSU over Alabama"